Using sound, dance, digital video and performative lecture devised by Emily Stone, a group of visiting and local performers trace the porous border between the home and the feral. 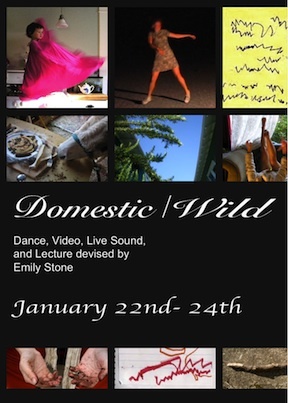 DOMESTIC/WILD is premiering at Performance Works NorthWest Jan 22 – 24, 2010 as part of the Alembic Series and the Fertile Ground Festival, a city-wide festival of new works. http://www.fertilegroundpdx.org/. BUY YOUR FERTILE GROUND FESTIVAL PASS HERE AND PWNW KEEPS HALF OF THE PURCHASE PRICE! Intricately weaving sound, dance, performative lecture and digital video, this show draws connections between overgrown brambles, animal husbandry, dust, late-night kitchen dances, monsters in the closet, mud in your mouth, your pants falling down on a cold day, getting lost and finding a place to sleep for the night. Emily Stone is curious about how the wild makes incursions into human-built spaces and how wilderness lingers in our own animal bodies. This primal confrontation between two disparate worlds promises to be both funny and arresting; one vision is that of a pregnant woman in a bear suit alongside soap made from lactating donkeys. There will be refreshments at intermission and doors blown open by the wind. There will be a singing saw and a bass clarinet. Come make yourself at home. For a year, Emily Stone and Kathleen Keogh have been creating a cabinet of curiosities, an evening of video, visual art, dance, and sound that, while consumed in small bites, adds up to a satisfyingly strange feast for the senses. A trio of Seattle performers creates site-specific dances in response to blackberry bushes, mud flats, and tool sheds in short videos interspersed throughout the evening. The trio of Portland dancers (who also happen to be mothers of small children) source their surprisingly feral domestic lives to make dances about holding the house together, running away from home, and opening oneself to extreme states of body language. Artist Karin Bolender visits from her homestead in rural Georgia to lecture about her resident herd of American Spotted Asses and how she invited participants from all over the nation to experiment with customized bars of raw assmilk soap. Throw in the wily performance group Woolly Mammoth Comes to Dinner (who may or may not be wearing pink underpants) and the live music improvisation of Golden Retriever and you have a show that will burn a bright hole in a cold January night. ﻿ Emily Stone is a multidisciplinary artist whose work is situated on the threshold of dance, theater, and visual arts. She crafts performance events that combine body-based research, non-traditional spaces and ways of engaging audiences, and text/images sourced from diverse materials including her own writing, video, photography and drawing. 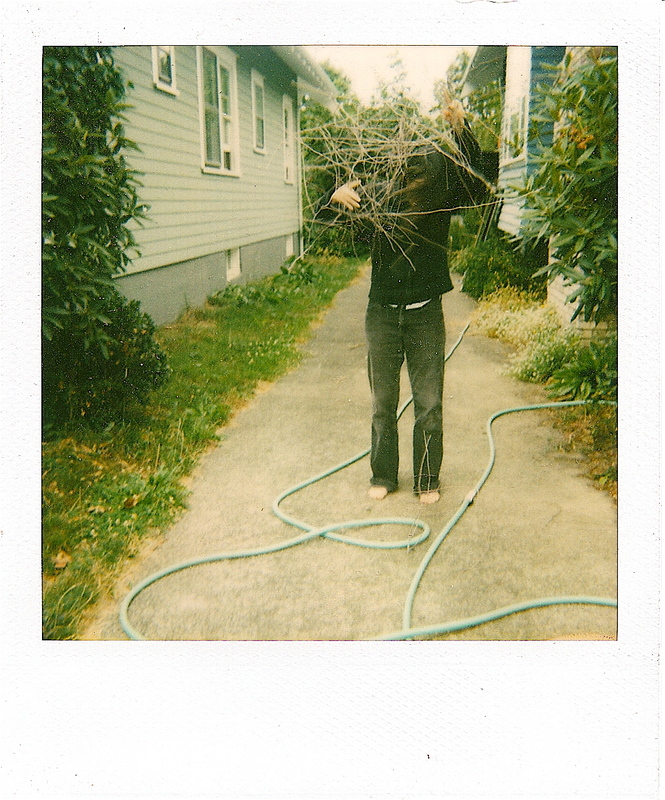 Emily’s collaboratively-devised projects have been produced by Performance Works Northwest, Portland Art Center, Conduit, Velocity, On the Boards, SFADI, 10 Tiny Dances, defunkt theater and PICA’s TBA Festival, among others. Her recent works include 4 walking tours/performance installations in public space for Gary Wiseman’s “Coffee Break”, teaching a “Jazzercise with Tom Waits!” class for Heavy Rotation, presenting a performative lecture on the Tuning Score for the “Authentic Enthusiasm” lecture series, and creating/performing a solo about claustrophobia for “Housebound” in the 2008 Alembic series with Work Corps, a collective of artists and writers. As a dancer, she has co-created works with Sheri Cohen, Beth Graczyk, Corrie Befort, Tahni Holt, Linda K Johnson, Angelle Hebert/Philip Kraft, Tiffany Lee Brown, and Linda Austin, as well as performed and directed with fellow Lewis and Clark College alum James Moore. Originally from Seattle, she lives and works as an arts educator in Portland, OR. Kestrel Gates finds spare moments to record site specific dances in the rooms of her house. Her primary mediums for creative expression are light, color, and parenting. Rebecca Harrison is a massage therapist and most recently performed as a dancer in Linda Austin’s and Seth Nehil’s Bandage a Knife. Rachel Kofron is a nurse midwife and a longtime lover of dance. Beth Graczyk is a contemporary dancer, choreographer, teacher and producer based in Seattle, WA. She has performed both nationally and internationally working extensively with Locate Performance Group, Sheri Cohen & Co., Corrie Befort, and Scott/Powell Performance. She was recently published in Nature Cell Biology for her work on mitosis. Sheri Cohen is an award-winning choreographer, a Guild Certified Feldenkrais Teacher and yoga instructor. Sheri’s contributions in choreography and performance have been recognized by generous support from Seattle Arts Commission, King County Arts Commission, Centrum Foundation, and Artist Trust of Washington. Golden Retriever is a music duo consisting of local musicians Matt Carlson (synthesizers) and Jonathan Sielaff (amplified bass clarinet). Jonathan has worked with Emily Stone before in 10 Tiny Dances at TBA 06. Matt Carlson is also a part of the group Oregon Painting Society, who invited Woolly Mammoth into a collaboration for TBA 09. Previous Post JAN 9: Performance+Party!